The majority of X-linked retinitis pigmentosa (XLRP) is due to mutations in the retinitis pigmentosa GTPase regulator (RPGR) gene. Determining the pathogenicity of novel variants is important for enrollment of patients into gene therapy trials. Sequencing and analysis of RPGR variants in ORF15 is challenging, as it is highly repetitive and rich in purines. Overlapping reading frames and polymorphic insertions / deletions add further complexity to the detection of mutations. Identifying systemic manifestations in affected males and carrier phenotype in related females expedites confirmation of pathogenic variants. The authors present a 16-year-old boy with a history of primary ciliary dyskinesia presenting with complaints of nyctalopia and visual field constriction. 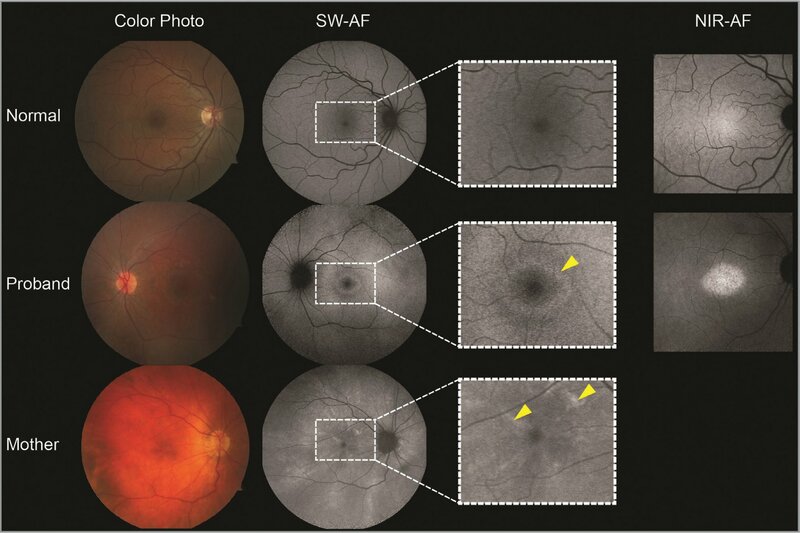 Multimodal imaging found peripheral thinning of the retina and a characteristic foveal hyperautofluorescent ring in the proband, and a carrier phenotype in the asymptomatic mother. A novel c.1059_1059+2delGGT, p.(?) variant in RPGR was identified as hemizygous in the affected boy and heterozygous in his mother. This case study expands the genotypic spectrum of RPGR variants associated with systemic manifestations. Illustration depicting RPGR localization within rod photoreceptors. 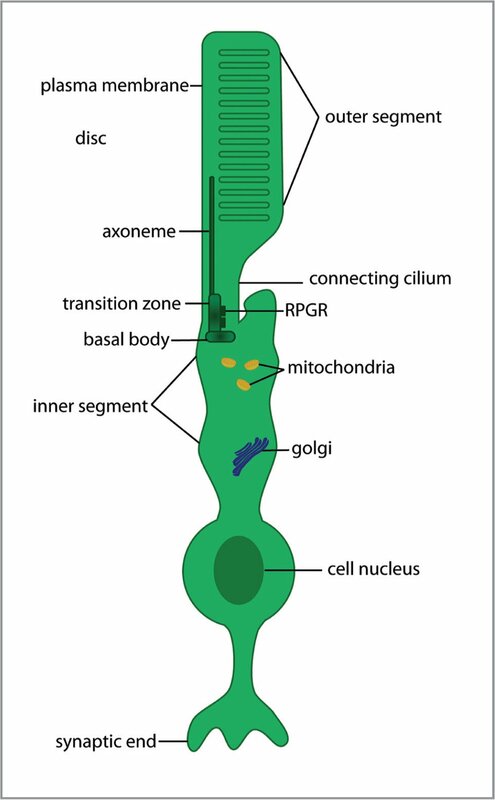 Schematic illustration depicting sub-cellular organization of a rod photoreceptor. The outer segment is the light-sensing portion of the cell and is directly adjacent to the retinal pigment epithelium. RPGR is localized predominantly in the photoreceptor cilium and is key for transporting proteins involved in phototransduction to the outer segments. Early diagnosis and genetic workup of XLRP in affected males is vital for determining the prognosis and risk to family members, as it is typically more severe than RP associated with other genes.8 Interestingly, studies have identified varying levels of visual function in female carriers. They are usually asymptomatic until late in life, with few severe cases reported, which likely result from skewed X-inactivation.2 An important fundus exam finding in carriers is the tapetal-like reflex, a metallic reflection within the peri-macular region resembling that of a tapetum seen in other animals. This reflex is easily seen on fundus autofluorescence and 488-nm reflectance imaging.9 Knowledge of potential systemic findings in affected males and carrier phenotype in female relatives can assist in making a genetic diagnosis. In this case study, we describe and characterize a novel hemizygous variant identified in RPGR of a 16-year-old boy with severe RP and a history of primary ciliary dyskinesia (PCD). A 16-year-old boy presented to the Harkness Eye Institute electroretinography clinic with complaints of progressive nyctalopia and visual field constriction identified by the referring ophthalmologist. Past medical history included asthma, recurrent sinusitis, and bronchitis, for which he received multiple bronchoscopies. He was diagnosed with PCD 10 years prior. Previous computed tomography (CT) of the chest from 4 years earlier showed marked multifocal bronchiectatic change in both lungs. There was no family history of similar vision loss or PCD. On exam, both eyes were myopic and best-corrected visual acuity (BCVA) was 20/20 in the right eye and 20/25 in the left. Anterior segment examination was unremarkable bilaterally. Dilated fundus exam revealed attenuated retinal arterioles bilaterally, as well as extensive mottling throughout the fundus with no intraretinal pigment migration. Short-wavelength fundus autofluorescence (FAF) (Figure 2) and spectral-domain optical coherence tomography (SD-OCT) were acquired after dilation (Spectralis HRA + OCT; Heidelberg Engineering, Heidelberg, Germany). Marked thinning of the peripheral photoreceptor cell layer was observed with relative sparing of the parafoveal region on SD-OCT (Figure A available at www.healio.com/OSLIRetina). A spatially corresponding hyperautofluorescent ring was seen on FAF in both eyes. Near-infrared fundus autofluorescence (NIR-AF) showed reduced melanization of the retinal pigment epithelium (RPE) encroaching on the central macula (Figure 2). Disease expression appeared symmetric between eyes (Figure A). A full-field electroretinogram (ffERG) was performed according to ISCEV standards in the photopic state for the proband; 30 Hz-flicker responses were not detectable using DTL-recording electrodes. Burian-Allen contact lenses (Hansen Labs, Coralville, IA) were then used, and responses were processed through narrow band-passed filtering with computed averaging, yielding residual 30 Hz-flicker amplitudes of 15.2 μV and 3.7 μV in the right and left eyes, respectively. Of note, the right eye response was contaminated by excess noise. Multimodal imaging of the proband and carrier mother harboring a pathogenic variant in RPGR. A digital color fundus photo (first column), short-wavelength (SW-AF) (second column), and near-IR autofluorescent image (NIR-AF) (last column) are depicted for a healthy young boy (top row), proband (middle row), and carrier mother (last row). The proband shows attenuated arterioles on exam, peripheral retinal pigment epithelium atrophy and a foveal hyperautofluorescent ring (yellow arrow) on SW-AF, and preserved melanization on NIR-AF that is restricted to the area spatially corresponding to within the hyperautofluorescent ring. The carrier mother shows a characteristic tapetal-reflex which is easily seen on SW-AF (yellow arrows) and oriented in a radial pattern. An inherited retinal dystrophy was strongly suspected, and the mother was recommended for evaluation. She denied any history of lung disease and reported a past ocular history that included amblyopia in the left eye. She did not have any new visual complaints. On exam, BCVA was 20/25 in the right eye and counting fingers at 3 feet in the left eye. On fundoscopy, a radially-oriented, tapetal-like reflex was seen throughout the field of view in both eyes. In the left eye, a focal area of RPE atrophy was seen inferior to the optic disc. Both fundi were otherwise unremarkable. FAF imaging of both eyes corroborated findings seen on exam, showing a bilateral and radially-arranged heterogeneous signal (Figure 2) (Figure B available at www.healio.com/OSLIRetina). FfERG was performed in scotopic and photopic states according to ISCEV standards, revealing relative asymmetry of generalized retinal function and mild decreases in 30 Hz-flicker amplitudes with an implicit time delay in each eye. Scotopic rod-specific b-wave amplitudes were within normal limits in the right eye and showed a borderline decrease in the left eye (Table A available at www.healio.com/OSLIRetina). The proband underwent whole exome sequencing at McLendon Clinical Laboratories (Chapel Hill, NC). A novel hemizygous variant in RPGR was identified and confirmed with Sanger sequencing, namely c.1059_1059+2delGGT, p.(?) (Figure C available at www.healio.com/OSLIRetina). 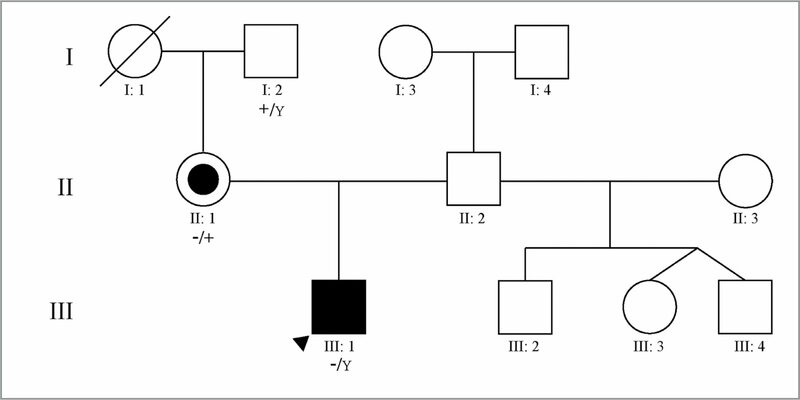 Parental segregation was confirmed in the mother who was tested for this variant (Figure 3). The proband's father was unavailable for clinical examination and segregation analysis of the identified novel variant. The maternal grandmother was previously deceased, and the maternal grandfather did not harbor the variant. Pedigree segregating a novel RPGR variant. Proband (III: 1) exhibits symptoms and characteristic imaging findings for retinitis pigmentosa and harbors a hemizygous c.1059_1059+2delGGT, p.(?) variant in RPGR. Mother of the proband (II: 1) exhibits the characteristic RPGR-carrier phenotype on retinal imaging and is heterozygous for the identified variant. + = wildtype allele; − = allele with RPGR variant; Y = Y chromosome in males investigated for the pathogenic RPGR variant. Previous investigations found associations between RPGR-associated RP and respiratory disease, as mutations are thought to affect cilia of photoreceptors and the respiratory airway.10–15 When compared amongst various species, RPGR ORF15 is the predominant isoform in photoreceptor connecting cilia regardless of the species of study, whereas constitutive RPGR (default) was found to be the sole variant in cilia lining the airway epithelia of the transition zone.4 The proband in this case presented with a history of PCD and RP. Whole exome sequencing identified a c.1059_1059+2delGGT, p.(?) variant in RPGR that causes a unique three base-pair deletion spanning the exon-intron 9 boundary, specifically removing the last nucleotide of coding exon 9 and neighboring canonical splice site donor nucleotides. Thus, the variant in our proband is likely to cause a frameshift in RPGR and disrupt correct splicing, potentially affecting multiple transcripts. The c.1059_1059+2delGGT, p.(?) variant has not been reported in 123,136 exome sequences and 15,496 whole-genome sequences ( http://gnomad.broadinstitute.org/; accessed March 2018). Parental segregation to the mother with a classic appearance of carrier phenotype further supports that this is a disease-causing variant. There are limitations to our investigation. The patient's diagnosis of PCD was reported by the mother and referring doctor; however, the precise diagnostic test performed to confirm this disease entity was not retrospectively available. Significant bronchiectasis in the non-cystic fibrosis pediatric population has a limited differential, which predominantly includes repeated infection (pneumonia), primary immunodeficiencies, primary ciliary dyskinesia, and congenital malformations.18 Although it remains possible that the multi-focal bronchiectasis noted on CT, along with the patient's history of asthma and sinusitis, are processes unrelated to his vision loss, this is less likely than a unified diagnosis. Future studies may benefit from clear diagnostic criteria before definitively diagnosing PCD in patients with RPGR-associated RP. There are many obstacles surrounding the precise diagnosis of retinal dystrophies, including availability of high-resolution retinal imaging and genetic testing for affected individuals. For RPGR-associated RP in particular, ORF15 is highly repetitive and rich in purines, complicating analysis of sequencing results. Overlapping reading frames and polymorphic insertions/deletions further hinder detection of disease causing variants.10 As in our case, identifying systemic symptoms in affected males or a carrier phenotype in female relatives may expedite the confirmation of novel RPGR variants, or variants of unknown significance, as pathogenic. This may be most useful when assessing XLRP patients with novel variants for enrollment in upcoming clinical trials. From Jonas Children's Vision Care, and Bernard & Shirlee Brown Glaucoma Laboratory, New York (SHT); the Department of Ophthalmology, Columbia University, New York (JDS, GF, GYC, SHT); Department of Medicine, Reading Hospital, West Reading, PA (JDS); John T. Mather Memorial Hospital, Port Jefferson, NY (GF); the Department of Pathology & Cell Biology, Columbia University, New York (CB, SHT); Frank H. Netter MD School of Medicine, Quinnipiac University, North Haven, CT (GYC); and the Institute of Human Nutrition, Vagelos College of Physicians and Surgeons, Columbia Stem Cell Initiative, Columbia University, New York (SHT). This study is supported, in part, by grants from National Eye Institute, NIH [P30EY019007, R01EY018213, R01EY024698, R01EY026682, R21AG050437, R24EY019861]; National Cancer Institute Core [5P30CA013696]; the Research to Prevent Blindness (RPB) Physician-Scientist Award; and unrestricted funds from RPB, New York, NY. Dr. Sengillo is supported by the RPB Medical Student Eye Research Fellowship. Dr. Tsang is a member of the RD-CURE Consortium and is supported by the Tistou and Charlotte Kerstan Foundation, the Schneeweiss Stem Cell Fund, New York State [C029572], the Foundation Fighting Blindness New York Regional Research Center Grant [C-NY05-0705-0312], the Crowley Family Fund, and the Gebroe Family Foundation. The funding sources had no role in study design or, collection, analysis and interpretation of data, writing the report, and the decision to submit the report for publication. The remaining authors report no relevant financial disclosures. Address correspondence to Stephen H. Tsang, MD, PhD, Harkness Eye Institute, 635 West 165th Street, Box 212, New York, NY 10032; email: sht2@cumc.columbia.edu.